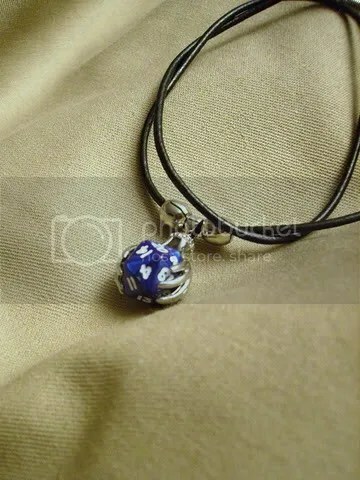 This particular pendant is from a collection I have up for sale and was made from a single pearlescent Pearlized Blue mini-d20. The die does not fall out of the clasp, and is held securely with just a little space for movement. The die kinda looks like it just jumped out of an oyster, tinted a beautiful shade of red and into my toolbox. I’d like one of those, so you can keep this for your records.